Super-Featherweight Lyon Woodstock believes upcoming foe Archie Sharp will find out the hard way that he isn’t ready to challenge him for his WBO European title. Leicester’s Woodstock (11-0) suggested that Archie Sharp (13-0) has taken desperate action to get a big, televised fight and should have taken an easier fight before challenging him. “This is a big step up for Archibald.” said Woodstock; chuckling away at his decision to call him by his full name. “but seriously, if I was…. Archie, I would have gone for someone on a level below me. He hasn’t done that and gone and jumped straight into the shark tank with a natural predator. Both Woodstock (25) and Sharp (23) began their boxing careers in the professional ranks in the summer of 2015. 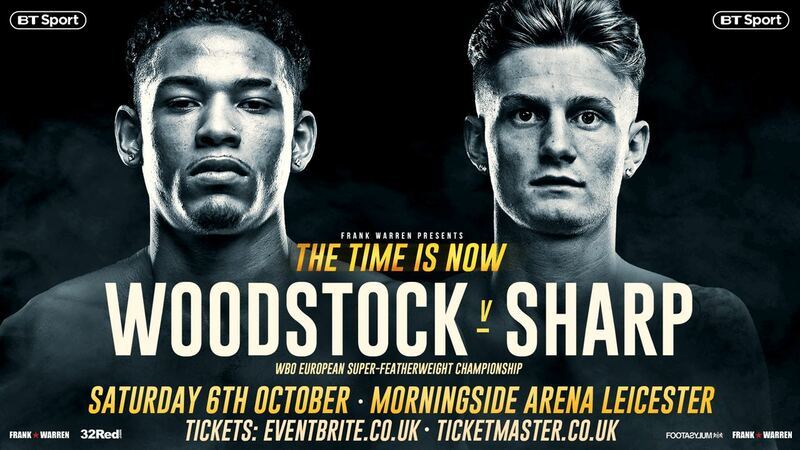 Woodstock has since gone on to win an area title and most recently the WBO European title in which was an entertaining scrap with southern area champion Craig Poxton in Leeds of October last year. Both of Woodstock’s title triumphs took place on televised events which were broadcast live on BT Sport. Sharp on the other hand has taken the route of progressing out of the spotlight and has racked up thirteen straight victories with seven coming by way of knockout on undercards and the small hall scene. Woodstock will be the home fighter going into the fight as the belt holder, and the fight taking place in an arena just a fifteen-minute walk away from his house. “He’s in a desperate position. He’s not entertaining, and his style isn’t as crisp as he seems to think it is. He’s a loose, open fighter and that just pay dividends to me” stated Woodstock.